Playing rummy online at Rummy Passion is easy and FREE. When you register and play for cash, you get a whopping Rs 10,000 as bonus money in the first week of your deposits. You get up to Rs 2000, Rs 3000 and Rs 5000 with your First deposit, Second deposit and deposit every Sunday. It does not get bigger and better than this. 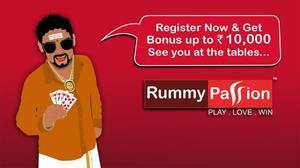 Playing at Rummy Passion automatically enrolls you to the Passion Rewards Club. The Loyalty Club is state of the art repertoire of exquisite rewards. It is divided into Silver, Gold, Platinum and Black Tiers. As you play, you will earn cash prizes, match bonuses and free roll tournament entries and move up the tiers to reach the ultimate Black Tier, a pinnacle of VVIP treatment & services.